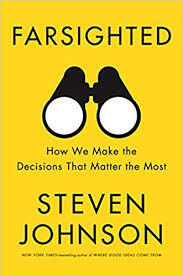 Decision making is something I sometimes struggle with, so when I received Farsighted: How We Make the Decisions That Matter the Most by Steven Johnson as my Next Big Idea Club selection this season, I was eager to read Johnson’s recommendations and learn some new tools. He shared several approaches for making better decisions when faced with a complex situation. My favorite is a concept developed by psychologist, Gary Klein. It’s called a premortem. A premortem is similar to a postmortem except instead of talking through what went wrong after it’s over, you debrief a problem or situation before you start working on it, identify all the things that could go wrong, and consider how you would handle them. I’ve actually written about this concept before, but it was in the context of project management. I can see how it would also be a helpful tool when I’m trying to make a complex decision. Johnson said when making complex choices, our initial gut reaction is always going to be too narrow. He said that doesn’t mean we should underestimate our instincts, but it does mean we should supplement them with exercises that force us to expand our point of view. This really spoke to me. I have always followed my gut when making decisions. Most of the time this has worked well for me, but there have certainly been times where it hasn’t worked as well as I had hoped. The next time I’m faced with a complex decision, I will conduct a premortem and try to force myself to examine the situation in a more critical capacity. I know this will help me look at the problem with a more critical eye and hopefully it will help me make a sound decision. How do you make complex decisions? If you also struggle with complex decisions, I recommend reading Farsighted: How We Make the Decisions That Matter the Most; Johnson included many other helpful techniques for decision making.